A revolutionary skin refining serum with innovative LIFTONIN®-XPRESS + SYN®-AKE to help visibly reduce the appearance of fine lines + wrinkles. Wrinkle Blur Technology softens the appearance of imperfections for a naturally smoother + more even looking complexion. As owners of a few (just a few!) little wrinkles here and there, we were really looking forward to seeing if this product lived up to its hype. After all, who doesn’t want to banish those fine lines from their lives? The serum is applied to the face and neck, morning and night before moisturising. It has a slightly sticky texture and although it sinks into skin reasonably well, it does leave a degree of tackiness on the surface until fully absorbed. This is aided by the application of moisturiser. Almost right away you can feel a tightening sensation, skin visibly becomes smoother and wrinkles are diminished – this product actually works! Before bed, and those rare days when we went make-up free, we saw clear value in this product’s results. However, we found there was a bit of a problem with the formula when using to prep the face for make-up. It seems to create a layer of ‘debris’ which peeled and flaked when applying foundation over the top. This issue goes hand in hand with our initial feeling of it not absorbing fully, which is fine when you’re just heading off to bed, but isn’t so great when you’re looking for a flawless base. The key seems to be using just enough, and to give the serum time to completely absorb before adding anything further to the skin. There’s no doubt that this is a great product and it does do what it sets out to. It loses one star though, for the issues we had with our foundation use. As it’s a relatively pricy product, we’d expect this sort of thing not to happen, but it certainly doesn’t take away from the serum’s fantastic ability in blurring out those lines! 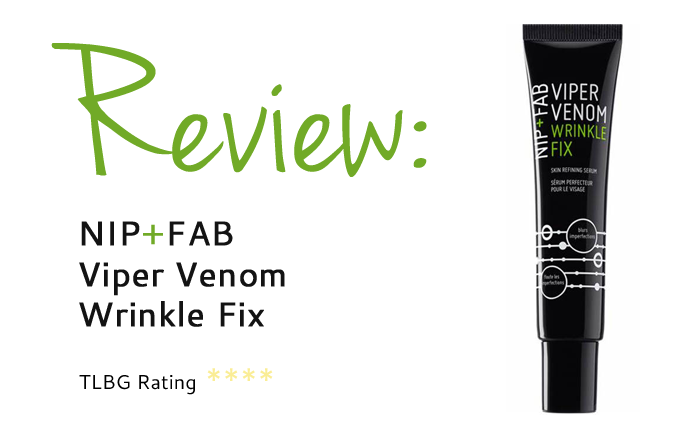 In case you missed it, check out our review of Nip+Fab’s Dragon’s Blood Fix Plumping Mask here.